« MY Mr Knightley: All Dressed Up! During the 18th century, there were many changes in society. The ongoing changes to agriculture and farming (the agricultural revolution) combined with the increased use of machinery and manufacture (the industrial revolution) created enormous social changes, as large influxes of people moved from the country to the city to find employment. These led to huge problems within cities that had suddenly swelled to accommodate greater numbers of people. Overcrowding, disease, lack of sanitation, poverty, hunger and crime were quite frequently the result for the working classes. Rapid change always tends to threaten the stability of a society, and so there were many people who were alarmed by these changes. In order to keep a sort of social order, publications began to abound on all sorts of moral topics. Conduct books were written to help guide young men and women through a wise path to adulthood. Novels were written with thinly veiled moral instruction to its readers. Journals, such as The Spectator and The Gentleman’s Magazine, discussed a variety of issues relating to propriety and manners. And pamphlets were written to alert people to the dangers of all manner of behaviours. 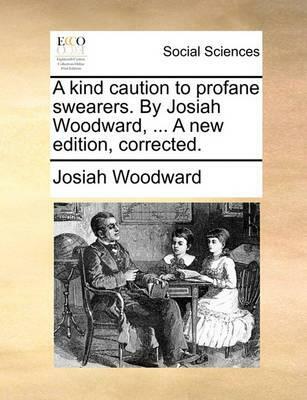 Josiah Woodward first published his pamphlet, entitled A Kind Caution to Profane Swearers, in 1705. He was a minister in the Church of England and this particular publication was reprinted several times in the following 100 years. It was designed to arrest the sad decline of manners that the author evidently perceived in the society around him. Nothing can be more piercing to the Heart of a Christian, than to hear the Multitudes of Oaths and profane Speeches which proceed out of the Mouths of many People, without any Sense of the Evil they do, or Fear of any Thing they must suffer for so doing. To hear the Great and Terrible Name of God polluted by Men, which is adored by Angels; and to consider how often that Sacred Name is profaned in common Discourse, which we are scarce worthy once to mention in our Prayers, is very horrible to all that have not lost the Sense of a Supreme Being. Opening lines of A Kind Caution to Profane Swearers, 1770 edition. In this pamphlet, Josiah Woodward laid before his readers a total of thirteen reasons to consider desisting from the ugly practise of swearing. Whilst several of these points seem to overlap, I have reproduced a portion of them here. 1. In the first Place, it must appear to the Sense of all Mankind, the rashest and foolishest Thing in the World, to provoke the Wrath of an infinitely powerful Being, and that meerly for the Sake of a few needless and impertinent Words, by which he may be justly provoked to cut you off in a Moment, and to cast you into remediless Torments. He then draws a parallel between this danger and that of reviling “a General at the Head of his Army” or waking a sleeping lion. 2. And in the next Place, your Baseness and Ingratitude is as great as your Danger, for it is a most senseless Thing to despise that Almighty Being which you at other Times adore. Is it not a ridiculous Folly to fall on your Knees to God one Hour, and to Blaspheme Him the next? I found this point interesting, as some individuals in the eighteenth century did seem to vary their observance of religious commands depending on whether it suited their fancy! James Boswell relates an incident in his diary where he was sitting in church planning how he could sleep with a woman. What a curious and inconsistent thing is the mind of Man! In the midst of divine service I was laying plans for having women, and yet I had the most sincere feelings of Religion. I imagine that my want of belief is the occasion of this: So that I can have all the feelings. I would try to make out a little consistency, this way. I have a warm heart and a vivacious fancy. I am therefore given to love, and also Piety or gratitude to God, and to the most brilliant and showy method of pubic Worship. From: James Boswell’s London Journal 1762-1763, 28th Nov 1762. 3. This [swearing] is such an Extremity of Sin, as can only be matched in Hell, where all are desperate, and without Hope of Mercy. … But for Man, that swims in the River of God’s Goodness, and is visited with fresh Presents of his Love every Moment; for this favourite creature to set his mouth against the Heavens, and to blaspheme a gracious, a patient, a bountiful God, is a Height of Sin which exceeds the Blackness of Hell itself. It does seem odd these days to think of swearing as exceeding the “Blackness of Hell”. Many injustices crop up in my mind as more deserving of this description! 4. And all this is done against God, without so much as pleasing any one of our Senses. It is a tasteless and fruitless Sin. It brings no Pleasure to the Palate, nor Gain to the Purse. And it may even puzzle the profane Person himself to tell us for what it is he sells his Soul. 5. And it is further to be considered, That the Tongue of Man is his Glory, and human Speech a Sort of Miracle in Nature. And it is given to Man, that he might glorify God who gave it to him. And will you, dare you pervert the Use of so divine a Gift? 6. And it is a very unhappy Circumstance of their Sin, that the Returns of it are frequent. Though it is of so horrible a Nature, and of such infinite guilt, yet it may be repeated many Times in a Minute, yea, we find some multiplying their Oaths in the same Breath. 7. Here the author reiterates how profane men despise the name of God, even though every other part of God is out of their reach and beyond their influence. 8. For hereby you harden Infidels against the Christian Religion. It cannot be expected that they should honour your God, when you yourselves despise him; or that any should embrace your Religion, when you yourselves trample it under your Feet. 9. Yea, God himself testifies, that his Name is great among the Heathen, Mal. 1:11. And we find an Heathen Emperor making a Decree, that whosoever spake any Thing amiss of Almighty God, should be cut in Pieces, and his House made a Dunghill, Dan. 3:29. This biblical reference is from the Book of Daniel, and relates the story of Shadrach, Meshach and Abednego who were saved by God after King Nebuchadnezzar had them thrown into the fiery furnace. The King then gives orders for everyone in the land to worship this God. 10. The author here states the law in regards to swearing. As good a reason as any to stop, I suppose! Every Day-Labourer, common Solider, common Sailor, and common Seaman, One Shilling. Every other Person, under the Degree of a Gentleman, Two Shillings. And every other Person, of or above the Degree of a Gentleman, Five Shillings. 11. At this point, the author hopes that by such a “slight Infliction” (which, I presume, is the fine), that the sinner might be “brought to a timely Sense of their Sin and Folly”. 12. Upon the Whole, How is every Lover of God, of Man, and of the Public Good, bound in Conscience to oppose this vile and horrible Sin? to reprove it, to shame it, and, in all fit Circumstances, to inform the Magistrate of it, and do their utmost to banish it from human Society? In short, do everything you can to stop this offence against God. Can you imagine the state of the eighteenth century law courts if every swearer was reported to the Magistrate? 13. … But let me entreat all Persons whatsoever, that have Reason and Self-love, that they cast not themselves into this accursed Herd of Blasphemers, lest after a little partnership with them in their Sin, they be for ever conjoined with them in their Punishment. Whilst we can laugh about the immense importance that eighteenth century clergyman placed on the sin of profanity, this pamphlet shows – to me, at least – how deep and unsettling the concern was over such rapid and vast changes to society. I find this aspect of the eighteenth century really intriguing. During this time, there was the continuance of the agricultural revolution, the emergence of the industrial revolution, the American Revolution (1775-1783), and the French Revolution (1789-1799). This was a period of time where everything that had been considered solid and unchanging in society, was changing violently! And when I read this pamphlet in the light of that information, it makes a bit more sense. Note: All italics are present in the original text. Hogarth: Gin Lane and Beer Street – a pair of paintings intended to instruct society on the dangers of drinking gin in the mid-eighteenth century. Do Women REALLY Talk Too Much? – Some snippets from some conduct literature of the eighteenth century. A Kind Caution to Profane Swearers, by Josiah Woodward – available online, reprinted at the end of The Solider’s Monitor; being serious advice to Soliders to behave themselves with a just Regard to Religion and true Manhood, by the same author (1760). Manner’s, Morals and Class in England: 1774-1858, by Marjorie Morgan.